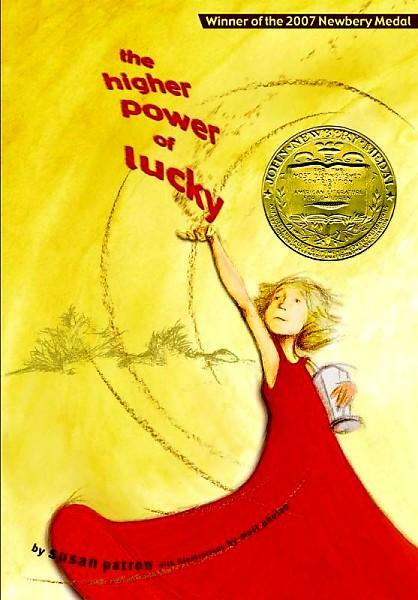 ...the Newbery winner from 2007. Also a fun book to read. Lucky, the main character, is just 10 years old, Dawna's age right now, and Lucky's mannerisms and behavior were perfect for that age, I thought! Lucky lives in a little town called Hard Pan, CA, with her guardian after her mother died. Lucky is smart, always doing her homework so she can be a world famous scientist someday. Lucky is brave, chasing snakes out of clothes dryers and staying calm in dust storms. Lucky is thoughtful, considering questions such as "What is my higher power?" But most of all, Lucky is still just a little girl who needs to feel secure and loved, which makes me think of my baby Dawna... who is not much of a baby anymore, but just like Lucky, needs to be picked up and snuggled from time to time so she can remember how much she is loved!